Synthpop band Erasure have announced a major tour which includes a stop-off at the Brighton Dome on February 19. During the month, Erasure will travel throughout the UK, finishing up with a return to London’s Hammersmith Eventim Apollo, before heading to Germany. The tour goes on sale on Friday (June 2), and full information will be at http://www.erasureinfo.com/concerts. As part of their tour, Erasure have unveiled the Vince Clarke remix of ‘Love You To The Sky’ from their new EP. 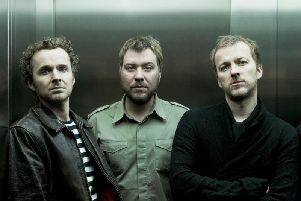 The original version of ‘Love You To The Sky’ is taken from World Be Gone, the band’s latest studio album, which went into the UK Official Albums Chart at No. 6, their highest new entry in the album chart since 1994’s I Say I Say I Say. The enduring BRIT and Ivor Novello winning pop duo have released a staggering number of albums, including 5 UK Number 1’s and 17 top 10 singles (35 singles charted in the UK Top 40) both the new album and the recent best of, Always, saw Erasure entering the Top 10 album charts once again. World Be Gone sees the award-winning songwriters in a reflective mood, giving the world and recent political upheavals a thoughtful examination and, as highlighted on the painted artwork showing a ship’s masthead rising up from being submerged in the stormy waters, looking forward to the future. The ‘Love You To The Sky’ EP is out on June 2 as a Maxi CD and Digital EP. In addition to the Vince Clarke remix, this includes mixes by Ladytron, Loframes, Adam Turner and Matt Pop as well as a previously unreleased b-side, ‘Nothing I Could Say’.